One of the main concerns during camping is the meal you have to prepare. However, when you plan ahead of time, and get a little creative, then, your meals will be delicious. Plus, the preparation of the meals will be so much fun before your camping trip. 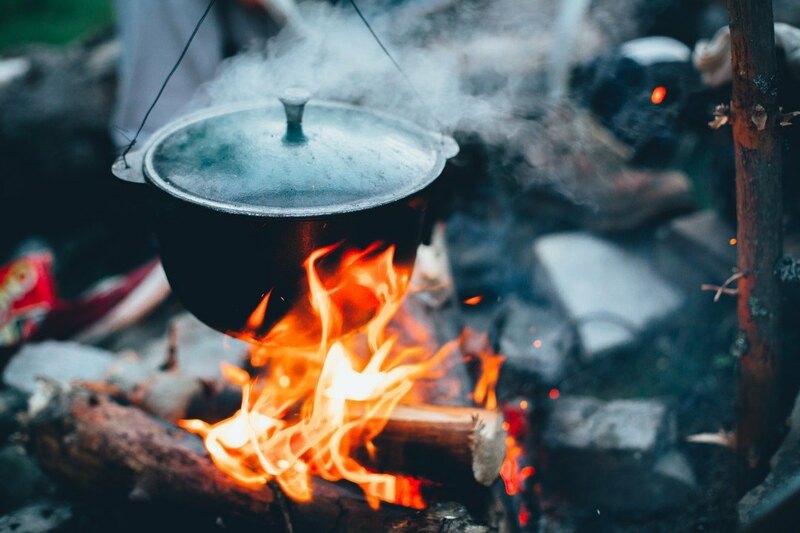 You see, cooking in camps may not be your typical home-cooked meals and frozen food entrees. However, you do not need to worry. The fresh air from the forest will surely boost your appetite while you prepare the simplest foods. But you need to make sure that you pack all of the essential equipment and ingredients for your food. Also, might as well bring some food preparation items and storage containers. The last thing you will ever want on your camping trip is to run out of food and other camping necessities. Some of the campsites are way too far from stores to do your groceries when your supply of food runs out. Thus, you need to bring enough food and water for the duration of your outdoor activity. Remember that these will make or break your camping experience. You will be able to build your typical camping food list if only you are patient and determined. However, before doing so, you need to make sure you know the details about your camping trip. You need to have the information of the campground, the duration of your journey, and the number of people going with you. Also, ensure that you know the weather a few days before you go on your adventure. So, if your camping will last more than a day, you need to pay attention to your camping essentials. Most importantly, you need to make sure that the food you’ll bring will last until the end of your trip. You have to plan what food you have to carry and base its amount on how long you are staying in the campsite. The arrival and the departure time are also very crucial for you to properly manage your meals. That way, you can easily plan out your breakfast, lunch, dinner, snacks, and drinks for the entire period. Another thing you have to add on your meal plan is the way you are going to prepare, and cook your food in the campground. Some people opt to bring a handheld camping stove while others use their campfire or ﻿﻿their﻿ ﻿﻿﻿grill﻿﻿. For the cooking type you’ll choose, there are various kinds of kitchen tools and equipment needed. After collecting enough details about the dish type and kitchen essentials to bring, scan your camping food list again. The next thing you’ll have to think about is the ingredients you’ll need for every meal. You need to match your camping foods with the campsite, the method of cooking, and the kitchen utensils. By doing so, you will prevent any redundancy, and use all of the ingredients. So, you need to ask yourself a lot of questions first. Then, ask yourself what type of heating you will require cooking your meal. Then, ask yourself: are there people who do not eat vegetables or meat in your group? How long will it last to prepare and cook the food? What type of meal shall you make in advance or the campground? Frankly, creating a menu for your camping is not a piece of cake. You have to mix all of the ingredients so you could create a meal. Then, you have to ensure that the combination will become tasty for everyone. Everyone loves pancakes in the morning, right? They taste even better if shared by many. So, before leaving your home, you need to make your homemade pancakes. Then, you have to prepare them on Ziploc bags to freeze them overnight. So you could pack them conveniently, you need to make sure that you place the flat in the fridge. By the time you’re set to travel, the batter will become thawed, and ready to cook. Gather the mixture in an area, then, cut it on edge. Throw some maple syrup on the pancakes, and your breakfast meal is all ready for the group to enjoy! 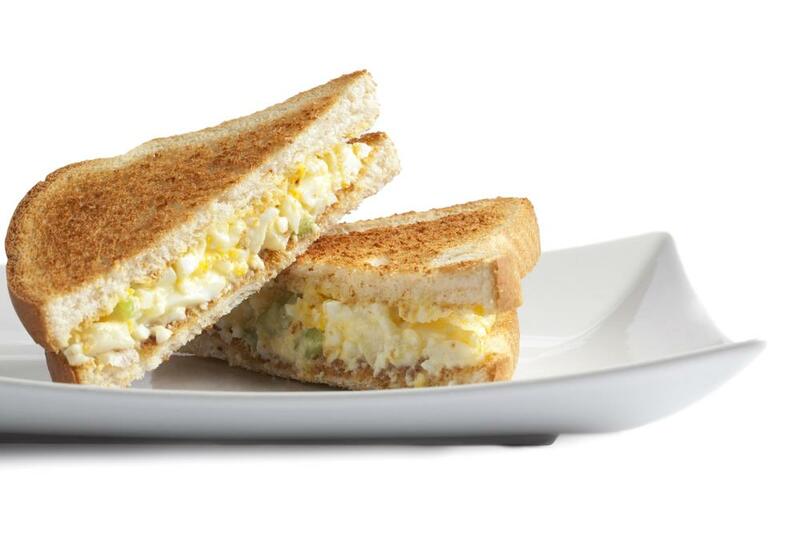 ​Egg sandwiches are not only great snacks for all time. These are great when you warm them in the campfire. So, for your camping trip, you just have to freeze it beforehand. Then, wrap them in foil. On the day of your camping, warm them on a portable﻿﻿﻿ ﻿grill in the morning, and store them in your cooler. 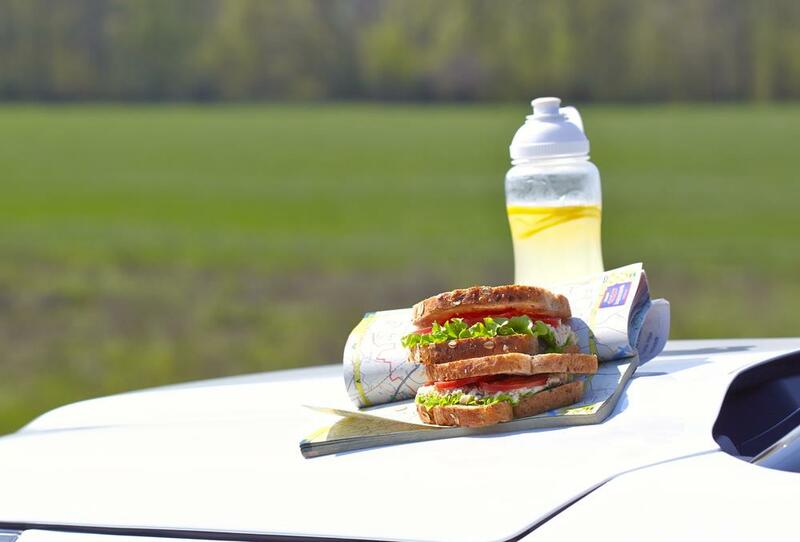 Make sure that you do not leave your sandwiches unattended because they get easily burned. After heating the egg sandwiches, you can munch on them right away for your snacks. You can also serve them in the morning for breakfast. To make an omelet in a bag, you need to use Ziploc bags. 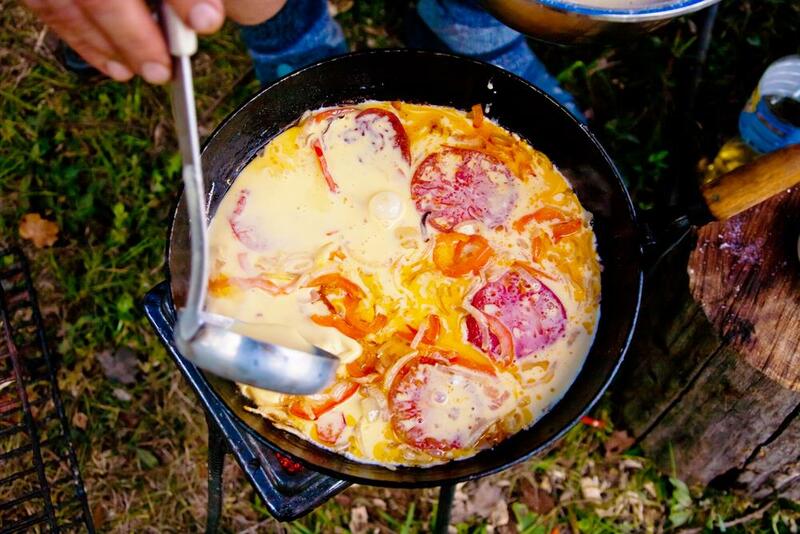 Also, utilizing boiling water, you can make homemade eggs for your entire camping team. What you need to do first is to crack the eggs open and put them into separate Ziploc bags. You may put two eggs in each bag. Next, you need to add some toppings, including peppers, cheese, onions, sausages, ham, and veggies. Place them in the cooler, and in the morning, boil a pot of water. Drop every Ziploc bag into the warm water. Let them cook for about 12 minutes. After that, gently pull out the bags, and obtain the omelets. Serve them while they are still hot! 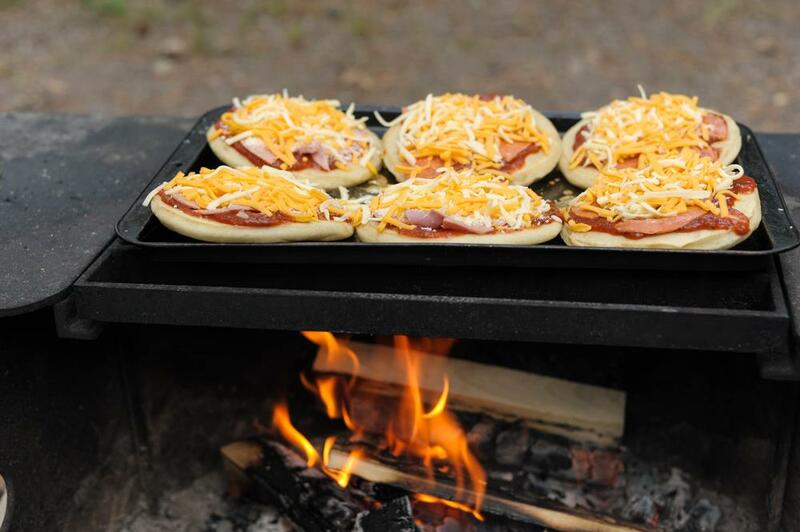 The next camping recipe you should put on your menu is a campfire pizza log. Firstly, you have to roll out your pizza dough into a rectangular shape. You may choose to create your own or just pull out the frozen dough. Then, put a half cup of tomato sauce, a few ounces of mozzarella cheese, and other toppings that you like. Begin at one tip of the dough like rolling a bath towel to create a correctly folded pizza. You may also throw some parsley on top for a colorful vibe. Next, wrap the pizza in a foil, and freeze it. It will preserve the pizza until you thaw it. As you are ready to cook it for dinner, all you need to do is to put it on a stove. You may also place it in the logs for about 20 to 25 minutes. Remember that you need to flip it on each side to avoid burning it. Once done, cut it into smaller parts, and serve it. Fresh pizza is such a great dinner meal for a family or a group of friends camping outdoors. Another easy recipe for your camping meal is to prepare taco soup. You can make this using just two cans of stewed tomatoes, two cups of beans, one cup of canned corns, and one pack of taco seasoning. Also, do not forget to add a pound of ground beef for some protein. Combine all of the ingredients in a large pot, and cook it all together. Freeze or chill it in a sealed freezer bag. While frozen, you have to place it in your cooler. When you already want to prepare the soup, put it in a pot. Then, simmer it. You may also add a bag of Fritos, and dinner is all serve! Sandwiches are great to serve for dinner or lunch. All you need is a loaf of French bread. Also, add some cheese slices, ham, mustard, lettuce, and butter. Do not completely cut the entire loaf of bread. 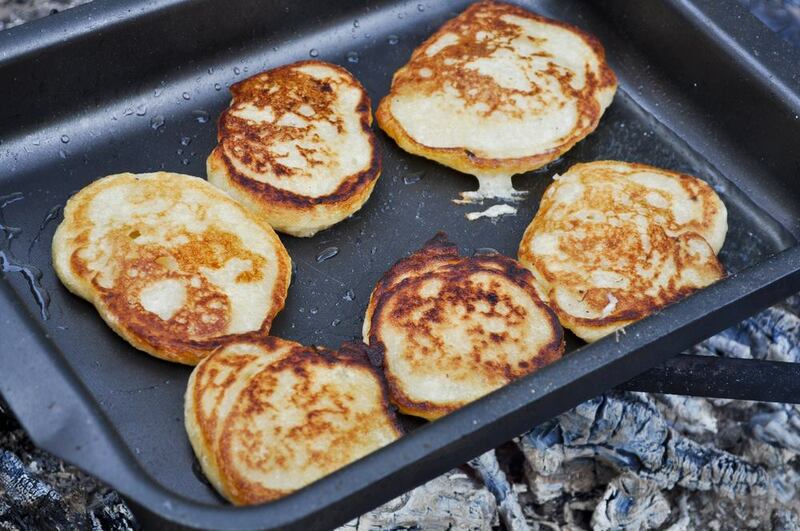 Just slice about ¾ inches thick, and make at least six campfire sandwiches. Then, cut it into around ¼ inch from the bottom of the bread. Put together at least three tablespoons of butter and one tablespoon of mustard. Then, spread the combination on each of the sliced loaves. Fold the cheese into a half, and place the ham, as well as the lettuce in the middle. Wrap the sandwiches in the foil. You may choose to freeze it overnight or just directly put it in your cooler. When you are ready to serve it for lunch or dinner, you may place it on the griller. Warm the campfire sandwiches for about 20 minutes until the cheese melts. Get rid of the foil from the loaf, and serve the sandwiches to your group. 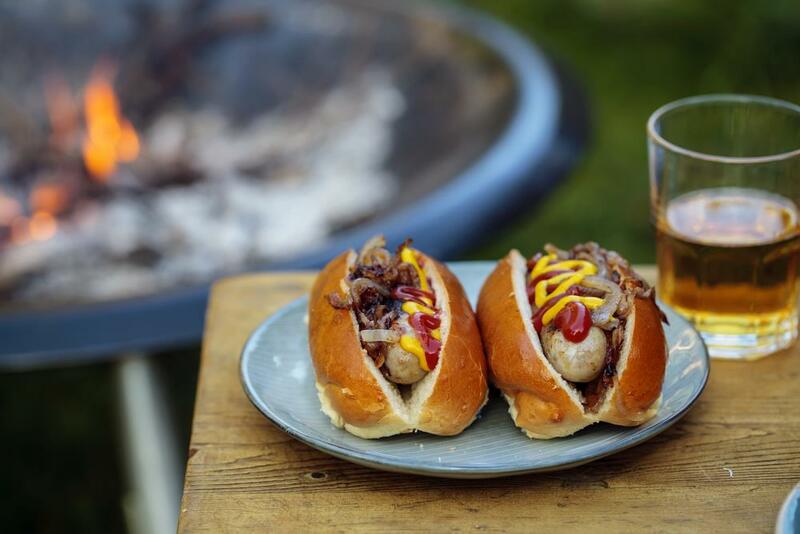 These are excellent alternatives for a regular hot dog. All you need to prepare is a pack of hot dogs and crescent rolls. Secure the crescent roll around the hot dog. Next, roast it until you cook the dough, and the hot dog becomes warm. It will take you about 10 minutes for the dough to cook in the right way. These are easy and delicious to prepare using just four main ingredients. All you need to do is to obtain some apples, sugar, butter, and cinnamon. Slice the apples so that you can fold up into a shape. You may utilize an apple slicer or a sharp knife. Put the apples into the foil. Use the foil to keep the apples in their form. Sprinkle some cinnamon and sugar on top of the apples, and add a tablespoon of butter. Wrap them in the foil so that you can pack them securely. Place the apples on the coals in the campfire for around five minutes. 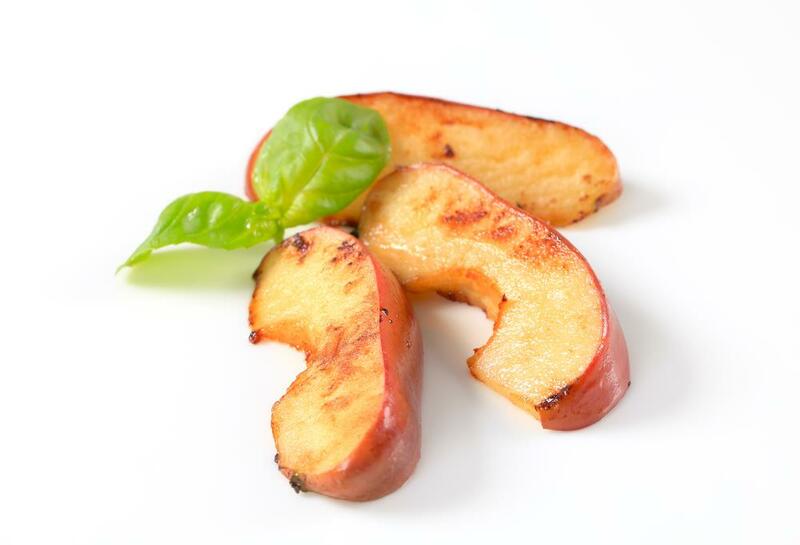 After doing so, you can dig in, and enjoy your campfire roasted apples! These are new twists to your usual and boring desserts for camping. Plus, they are also easy to prepare by just using three ingredients. All you need is a pack of crescent roll, chocolate frosting, and cool whip cream. Secure the crescent rolls around your hot dog sticks. Ensure that they are close to each end. Hold onto the hot coals as you consistently turn the stick, so it will not burn. It will take you about 10 minutes to cook the éclairs. Fill them with chocolate frost and fresh whip cream. 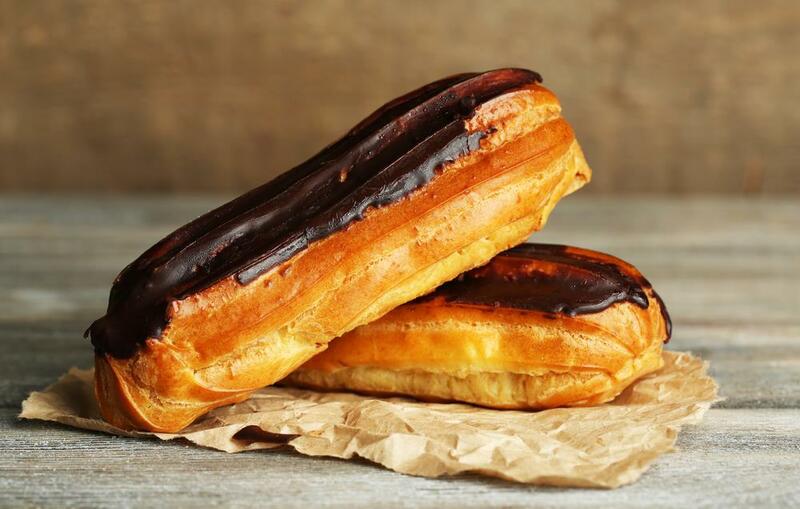 However, you can always choose various fillings for your camping éclairs. It is a unique twist to your regular cake. What’s even more exciting is that you have to bake the cake in an orange. Firstly, slice the tip of the orange, and remove its flesh. Take some time to scoop out the entire flesh. 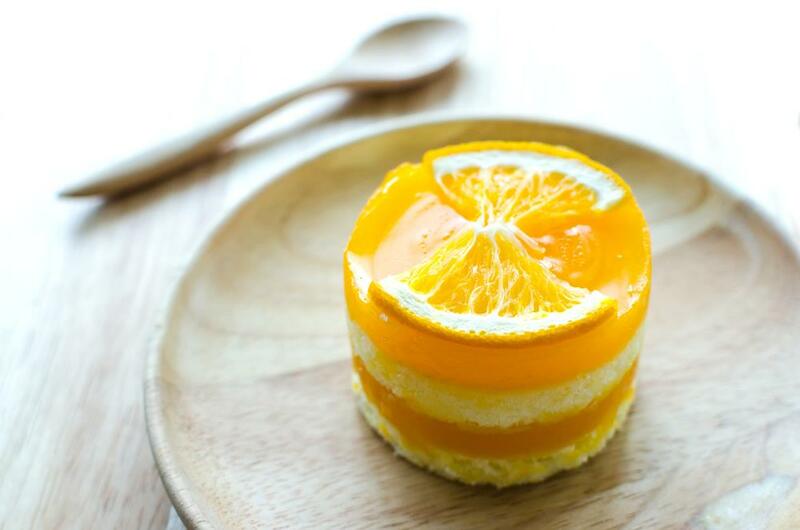 Make sure that the orange still retains its shape. Fill the orange with ready-to-cook cake mix or a homemade batter. Secure some time for it to rise. You may fill it over halfway full. Place the top of the orange back to its original position. Then, wrap it in foil. You may place it on hot coals for about 15 to 20 minutes. Try to turn it around every five minutes. It will surely smell and taste delicious. To prepare for the camping trip of a lifetime, you need to make your camping food list and menu. These are essential factors for a successful camping experience, especially for first-timers. Also, you may follow our suggested camping meals and recipes for your breakfast, lunch, snacks, and dinner. 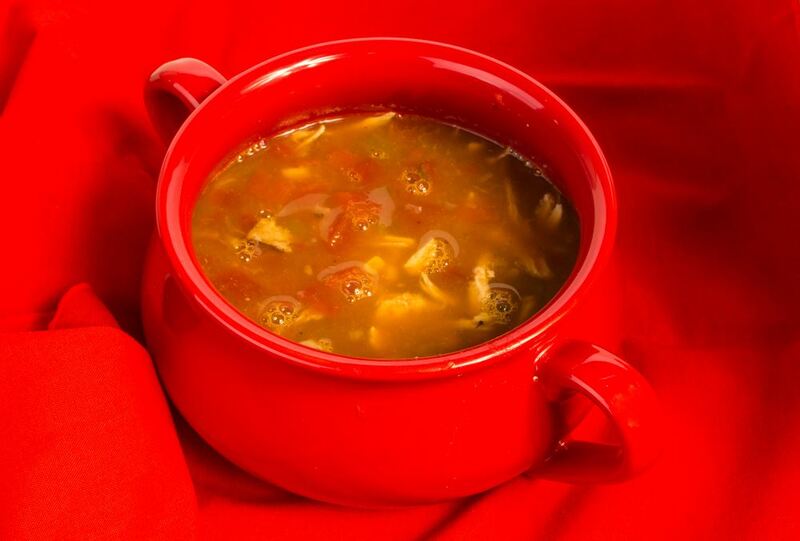 We assure you that they are healthy, easy, and delicious to cook. Plus, the list is super straightforward and safe to prepare in your home or even at your campsite.